Babblings of a Mommy: Vivienne Westwood Sandals For Your Little Girl! Vivienne Westwood Sandals For Your Little Girl! The line is called Mini Melissa and you can choose from 6 different colors from the Hearts and Bows Collection designed by Ms. Westwood herself. 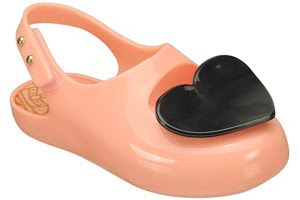 They are said to be extremely soft with ample padding on the soles and the hearts are made out of soft plastic. What's the best part? They smell like bubble gum! (YUM) Aren't they the cutest?! If you MUST have them for your little princess, they're only available through Brooklyn based boutique Epaulet and they retail for $100.